You probably already know that getting found in search rankings is a critical part of running a successful e-commerce company. Powerful, targeted keywords are the foundation of a successful SEO content strategy, but choosing the best ones can be a mystifying process. We’ll help you understand and get started with your e-commerce keyword research. This will keep track of the basic information you need to choose the best keywords. As you start taking your keyword research to a more advanced level, you can start to include things like global or local searches and keyword analysis information from tools like SEOmoz. Check out this post from Kissmetrics for a more advanced keyword organization strategy. You probably already have an idea of some good keywords for your e-commerce business. For example, if you run a cat supply store, you know you want to get found for the products you sell, like cat food and toys. You may also want to target a particular geographic market, or attract people searching for specific brands. Products, locations, services, and brands are a great starting point for your keyword research. Go ahead and jot down everything you can think of in your spreadsheet. When you’re coming up with keywords, it’s important to understand the difference between broad keywords and long-tail keywords. 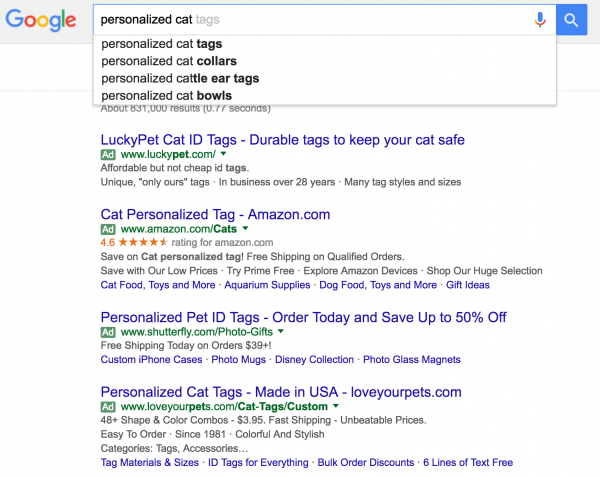 Broad keywords are general things like catnip, scratching posts, and collars. These keywords tend to have a high search volume, with lots of competition. Because they’re so generic, visitors who find your site while searching for them may not to be very good leads. Long-tail keywords are specific phrases, such as “organic fair trade catnip,” “Eiffel Tower scratching post,” and “personalized Wonder Woman kitty collar.” Fewer people are searching for these specific things, but the ones that are are your target customers. When coming up with keywords, focus on discovering long-tail keywords, and getting creative with permutations of those. SEMrush: This tool gives you an idea of what keywords your competitors are using. Enter your competitor’s domain in the search bar to see the top organic and paid keywords they’re using to get traffic. 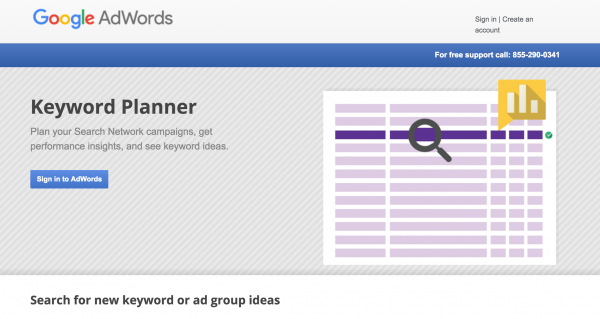 Google AdWords Keyword Tool: AdWords is a powerful tool for getting a sense of keyword popularity and competition. AdWords will also give you suggestions for keywords similar to the thing that you are searching for. Thesaurus.com: Looking for another way to say it? Try plugging words into Thesaurus.com to find synonyms. Want more tools? Check out our post on four free keyword tools, or this ultimate list from Evolving SEO. Add all the relevant keywords you find into your spreadsheet. Don’t worry about how popular they might be at this point – we’ll deal with that further on. Now, it’s time to read through your list and see what kind of gold you’ve found. Copy and paste the entire list into Google Keyword Planner, then download the results as a spreadsheet. This will give you a ton of data about each keyword. What were looking for at this point, however, is just the volume and competition data. Once you have the spreadsheet, you can then paste the keywords along with volume and competition numbers back in your original spreadsheet. Sort through the results by volume. This will order your keywords in terms of popularity, and help you know where to focus your efforts. By now you should have a list of 50-100 keywords, ranked by order of search volume. But just because a keyword has a high search volume doesn’t mean it’s perfect for your business – it’s time to refine your list. Is this keyword really relevant to my business? Does it accurately describe my store, and the products I sell? If someone searches for this term and lands on my site, will they find exactly what they’re looking for? These are important questions. Ranking well for an unrelated keyword may get you a lot of search traffic, but unless searchers land on a high-quality page that gives them exactly what they’re looking for, they’ll bounce instantly. A high bounce rate can cause you to slip in the rankings, and, worse, it can turn potential customers off to your business. The last step is to plug your keywords into the popular search engines like Google and Bing. This will give you an idea of what your organic search competition is like, and let you see how hard it will be to rank for a certain keyword. If the top results are all major established brands, for example, it’ll be harder to shoulder your way onto the first page. Once you’ve gone through these steps, you’ll have a short list of keyword gold. You’ll hopefully have identified about 5 really good focus keywords, with another 5-10 less potent ones to keep as backup. SEO strategy is a long-term game. With each new piece of targeted content you introduce on your site, your rankings will continue to improve. What are your favorite ways to generate powerful keywords for your e-commerce business? Let us know in the comments. Hey, great advices! I want to add that google trends is also an useful tool if we want to find out which keywords or expressions people search the most. This will help us to choose which of them to include in our content. Subscribe now and you'll be a cool cat too! What updates would you like to receive?